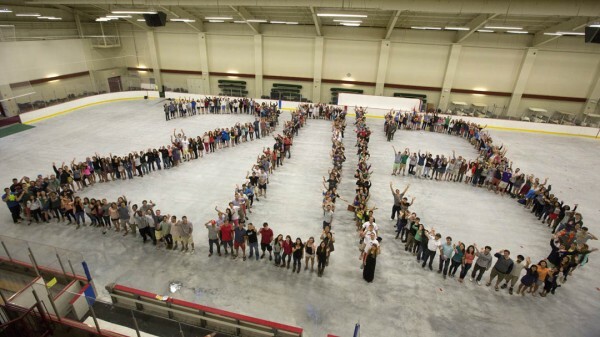 The members of this year’s graduating class gathered in Underhill Arena on May 24 for their class photo. Photo by Mike Bradley/Bates College. Bates will award bachelor’s degrees to 436 students Sunday — the 234 women and 202 men being recognized as the Class of 2013. The graduates include 39 students from Maine, 178 from the other five New England states and 171 from 28 other states throughout the country — representation from 34 states in total. The class also includes 48 students from outside the U.S., representing 29 countries. Psychology was the most popular major among the group (58 students), with economics ranked second this year (46). History and politics tied for third place, with 40 majors each. Among that group, mathematics and politics are tied for the most popular second major, with eight apiece. French is next with seven. Economics and psychology tie at five each. Bachelor of arts degrees will go to 344 members of the class (182 women, 162 men), while 92 will receive bachelor of science degrees (52 women, 40 men).